For those of you that do not know, a Support Coordinator is someone with expertise in assisting individuals with special needs and their families in their planning process and with coordination of services. 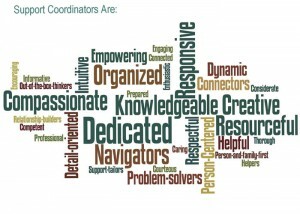 Focusing on an individual’s needs, hopes, and dreams, Support Coordinators use their expertise to guide them in the development of their support plan, used to coordinate and monitor appropriate services and supports for the individual. 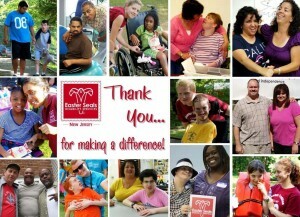 Thank you to all family caregivers! Easter Seals New Jersey recognizes the various struggles that many caregivers sometimes face when they are caring for a loved one. Often times, these same individuals neglect to care for themselves. For all of you that do not know, November is National Family Caregivers Month, and to honor all of you caregivers out there who work hard all day, every day, to care for your loved ones, this post is for you. As most of you know, being a caregiver can be extremely stressful, not giving yourself enough time in the day to worry about your own needs because you are always concerned about someone else’s. When you do focus on your needs, it may feel selfish and unnatural. It is important to understand that an essential part of being a caregiver is to make sure you put yourself first at times. While you may think it will compromise the care of your loved one, you have to understand that it will not. Both your life, and the life of your loved one, depends on your well-being. With that being said, here are 6 helpful tips on how to manage caregiver stress and the busy lifestyle that comes with it.